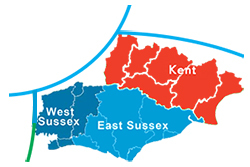 The Children’s Respite Trust exists to provide high quality care for disabled children and support for their families in East Sussex, parts of West Sussex and Kent, as shown on this map below. Roughly speaking, we see families east of the A24, south and east of the M25 and south of the M20. We’d love to be able to help all families with disabled children, but sadly need to prioritise our efforts to those most in need. We take a holistic view and assess the child in the context of their family and the consequent impact of the disability. Very often it is not straight forward, as children will have a variety of symptoms rather an a single recognisable condition.